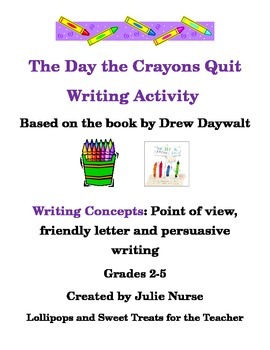 *This writing activity is based on the book, The Day the Crayons Quit by Drew Daywalt. 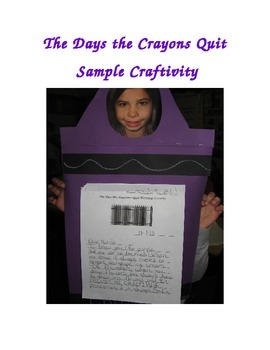 *In this activity, students select a crayon color and write a friendly letter from the point of the view of the crayon. 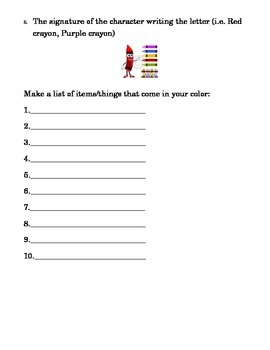 *Students list 10 items that come in that particular color to include in the rough draft copy. 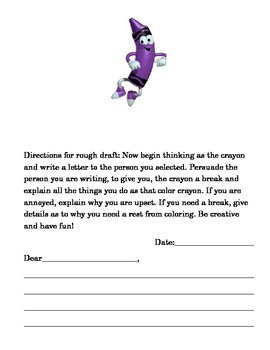 *As the character of the crayon, the student writes a letter to a person explaining why he/she (the crayon) is annoyed by always having to color particular items and persuading the person to give the crayon a much needed "break." *Extension activity: Students can then make a crayon character with facial features using 12 X 18 construction paper. Sample crayons character images are included. This is a fun writing activity for students in grades 2-5! May your students write many colorful stories!